Put aside England's Premier League and forget France's Ligue 1 ; say arrivederci to Serie A and hasta luego to the Spanish La Liga, the Bundesliga leads them all with an astonishing five-year German top-flight high goals-per-game ratio. We've had 3-3s and 4-3s, 7-1s and 4-2s in what has been an electrifying Bundesliga season so far. On top of the pile by an Autobahn mile are Borussia Dortmund, Lucien Favre's formidable outfit racking up a new club record 33 goals after their 11 matches to date, including three against the defending champions in Der Klassiker. Indeed, Dortmund have been so deadly, the Black-Yellow behemoth bagged at least four goals in four straight Bundesliga games between Matchdays 5 and 8. Let's not even get started on BVB's 46 goals in six games across all competitions - including four without reply against Atletico Madrid in the UEFA Champions League. Our pulses are already pounding at a perilous pace. 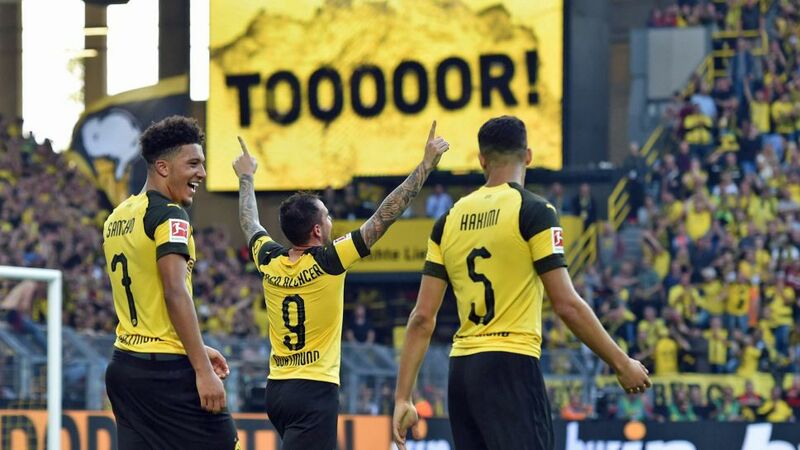 If Axel Witsel's memorable August Goal of the Month winner wowed on opening weekend, Jacob Bruun Larsen's hot hit was September's stand-out strike. Yet it's Spaniard Paco Alcacer who has been the ace in Die Schwarzgelben's goal-getting pack, the recently arrived 25-year-old scoring a record eight times in just 218 minutes! That means Crown Prince Paco has powered home a goal every 29 minutes, and almost every one a peach. Alongside the club's assist king Jadon Sancho, the Bundesliga has a partnership that is outdoing European football's priciest attacking pair, Kylian Mbappe and Neymar. As if that were not enough, Eintracht Frankfurt forwards Sebastien Haller and Luka Jovic are blazing a trail at the top of the scoring charts. Warming up with successful strikes in back-to-back matches, the 20-year old super Serb stunned the global footballing community on Matchday 8 by netting FIVE times against poor Fortuna Düsseldorf, becoming the youngest player ever to do so in the Bundesliga. "I was 12 when I last scored five in the same game," Jovic enthused after his awesome feat. He boosted his haul to a league-leading nine with a brace against Schalke on Matchday 11, all of those goals coming in his past six outings in what is becoming one of the most exciting seasons in Germany's elite to date. The wow factor has been enhanced with over 35 goals from long-distance. For some awe-inspiring shooting finesse on that front, check out high-flying Werder Bremen midfielder Maximilian Eggestein of whose four goals this season, three have been delivered from downtown. And even the Bundesliga's coaches have been getting in on the act! They may not have actually been nodding them in from the sidelines, however, our shrewd tacticians have made the changes that have accounted for 60 goals from substitutes - or what our German friends refer to as Joker goals. It may merely have been a general observation in view of the standard of strikes regaling Bundesliga followers this season. The questions at this point are numerous: can Hertha Berlin’s Slovak trickster Ondrej Duda add to his best-ever senior season and take his tally – which currently stands at six goals – into double figures? Can Hoffenheim’s English starlet Reiss Nelson – currently on six goals in seven games - continue to make a name for himself in Europe’s most exciting league? And just how many goals can the Marco Reus-led BVB end this crazy campaign with? In the midst of an Autumn of on-field fireworks, Bundesliga fans are happily suffering from goal fever as we wait to see the next scoring records that are set to fall. It’s football as it’s meant to be, and you can follow it all with us this on bundesliga.com and across our social media channels.